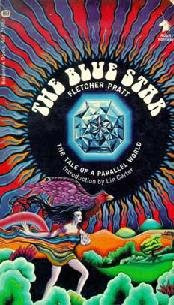 The Blue Star is an alternate universe novel written by Fletcher Pratt in 1952. The cover to the left is of the Ballantine paperback edition, published in 1969, back during the heyday of pulp fantasy reprints aimed at a new generation of readers. It's no surprise to me that Dungeons & Dragons arose at the time that it did, as many were exposed to writers and stories for the first time that they were too young to have read previously. Regardless of what one thinks of Lin Carter's original contributions to the fields of fantasy and horror, there's no question that we all owe him a debt of gratitude for his role in promoting otherwise forgotten authors and tales in the late 60s and early 70s. The Blue Star takes place in a world where magic works and gunpowder doesn't, resulting in a setting vaguely reminiscent of 18th century central Europe. Its protagonist is Rodvard Bergelin, an inconsequential government clerk who becomes embroiled in a vast plot to overthrow the current regime and create a new society in its place. It's another interesting piece of work by Pratt, both because of his eye for details and because Gary Gygax mentions it by name as an inspiration for D&D. I grow ever more convinced that most gamers -- and designers -- are ignorant of the powerful influence of alternate universe and Lost World literature on the game and that their ignorance has been one of the engines for pushing the game in directions very different than those that at least Gygax intended for his creation. This is a topic I'm thinking a lot about and will be returning to in a future post, but I need some more time to consider the implications of the thesis I'm developing. The Blue Star is one of my favorite books in the fantasy genre -- wonderfully written, great story (a love story, with some action and suspense but not a lot of violence and killing), and fantastic extrapolation and world-building (which is all the more impressive because Pratt doesn't spend a lot of time on exposition and background and lets the details of his world emerge organically through the story -- I'm sure Pratt had worked out all kinds of details about this world that didn't make it into the novel). I think that Gygax's AErth, Lejendary Earth, and Yggsburgh probably owe a lot of their feel to this book -- the way that the world has developed "logically" into something resembling post-Renaissance Europe but with magic and no gunpowder. Very different than the faux-medievalism of Tolkien and his followers. I don't believe this book is currently in print, but it's well worth seeking out a used copy. I'm fascinated by your choice of The Blue Star, since I would've picked The Well of the Unicorn as a more influential work of fantasy related to D&D. Aside from its inspiration from Dunsany, The Well of the Unicorn provides a lot to think about within Pratt's rather terse writing style. I like both books immensely, but I'm curious why you selected one and not the other (if there is any particular reason, that is). Funny you should mention the Lost World literature. Gygax put a "Lost World" area in his original campaign world (in the place that was analogous to California), and it made it into the published version in the form of some very odd additions to the wilderness encounter tables out in the Sulhaut and Crystalmist mountains. And there was, of course, the Isle of the Ape. That's right. I'll eventually get around to posting the covers of other books with a connection to D&D, but, for now, I'm primarily sticking to ones drawn from Appendix N.
I personally find it very interesting how diverse were D&D's inspirations and yet, despite that diversity, Gary was able to spin them into something resembling a vaguely coherent whole. It's why I think it's a mistake to look on even pulp fantasy as the only lens through which to understand the game. The simple fact is that D&D quickly became its own unique genre, which, while heavily inspired by certain things more than others, transcends all of its inspirations.